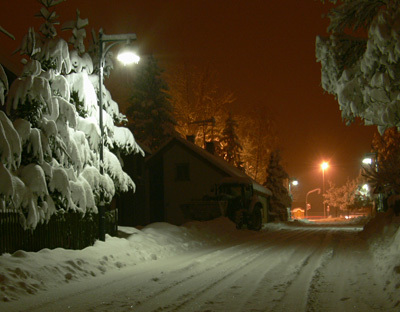 Grab Shot 21 - "Snow Scene"
"I love night shots," said Oliver Breidenbach. "Recently, we had a surprise snow storm resulting in the heaviest snow since the beginning of weather records [in Germany]. I had to wade through 2 feet of snow to get out of the house and onto the street to make these shots with my new Panasonic Lumix DMC-FZ30. Looking at these pictures help me remember the feelings that I had when I shot them." Oliver recorded the shot with a 4-second exposure at f-6.3 with the ISO set at 80. Love this shot. Nice work, Oliver.